Toni Francesc Spring/Summer 2011 "Urban Forest" collection is as versatile as wood itself, appearing in its most natural dimension, as seen in tree bark or in its most elaborate wooden forms - carved or molded. The collection combines rough forms with cleaner volumes and straight, milder lines. The palette depicts natural landscapes through soft, neutral shades of beige, white and grey, brightened by yellow, turquoise and coral. Toni Francesc always has a futuristic feel, with amazing draping and seam details. 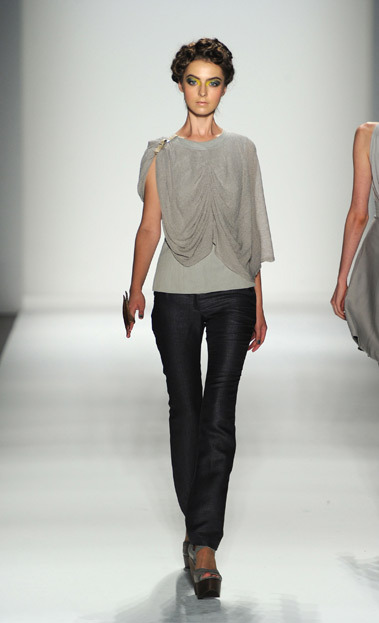 This time his collection includes delicate, lightweight fabrics and a natural ease. Whether it be pants or mini dresses, the fit is flattering to the body with strap detailing built into some of the looks. Several of the looks included wooden necklaces and bracelets, strengthening that eco-friendly, modern appeal based on the recycling of natural elements.